Junior Research Fellow- Passed M.Sc Degree in Chemistry/Organic Chemistry/Natural Products/ Biological Sciences with minimum 55% Marks from a Recognized University and NET/GATE/NET LS Exam Qualified. Project Assistant/Project Fellow- Passed B.Sc/M.Sc/B.Tech/MLISC Degree with 55% Marks in Concerned Discipline from a Recognized University. Project Assistant III- Passed M.Sc Degree in Chemistry or Equivalent Discipline with 55% Marks and minimum 2 year Work Experience in similar Field. 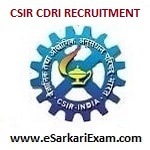 Eligible Candidates can Attend CSIR CDRI Walkin Interview 2019 at the Given Venue and Schedule. Applicants First Open CDRI or CSIR Official Website. Click on Walkin Interview for Engagement of Project Staff Under Different Projects to be Held on 23-04-2019 Link at News Section. Keep All the Required Documents as Well as Copy of Documents and Attend the Walkin Interview at Given Venue, Schedule and Time. For More Details Read Official Notification.